UPDATE: Apple released iOS 5.1 firmware. Apple has stopped signing iOS 5.0.1, so you can NOT restore to 5.0.1 any more. If you are on 5.0.1 you can jailbreak with RedSn0w. 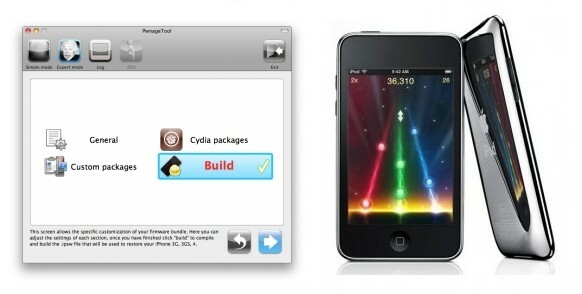 Using this tutorial you will be able to untether jailbreak iOS 5.0.1 running on iPhone 4. Pwnagetool will also preserve baseband version if you need carrier unlock. This tutorial uses PwnageTool 5.0.1 for Mac OS X. 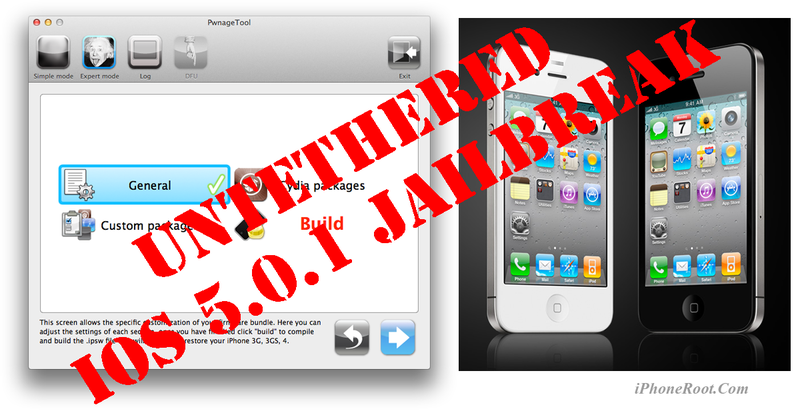 Using this tutorial you will be able to untether jailbreak iOS 5.0.1 running on iPhone 3GS. Pwnagetool will also preserve baseband version if you need carrier unlock. If you have updated the baseband to version 06.15, you can use this tutorial to update to iOS 5.0.1. This tutorial uses PwnageTool 5.0.1 for Mac OS X. Using this tutorial you will be able to create custom firmware and untether jailbreak iOS 4.3 running on Apple TV 2G. This tutorial uses PwnageTool 4.3.3.1 for Mac OS X. Using this tutorial you will be able to untether jailbreak iOS 4.3.3 running on iPad first generation. This tutorial uses PwnageTool 4.3.3.1 for Mac OS X. Using this tutorial you will be able to untether jailbreak iOS 4.3.3 running on iPod Touch 4G. This tutorial uses PwnageTool 4.3.3.1 for Mac OS X. Using this tutorial you will be able to untether jailbreak iOS 4.3.3 running on iPod Touch 3G. This tutorial uses PwnageTool 4.3.3.1 for Mac OS X. Using this tutorial you will be able to untether jailbreak iOS 4.3.3 running on iPhone 4. Pwnagetool will also preserve baseband version if you need carrier unlock. This tutorial uses PwnageTool 4.3.3.1 for Mac OS X. Using this tutorial you will be able to untether jailbreak iOS 4.3.3 running on iPhone 3GS. Pwnagetool will also preserve baseband version if you need carrier unlock. If you have updated the baseband to version 06.15, you can use this tutorial to update to iOS 4.3.3. This tutorial uses PwnageTool 4.3.3.1 for Mac OS X.
UPDate: Attention! We've received info, that Apple stopped signing iOS 4.2 for devices for which iOS 4.3 is available. This means you will not be able to restore to 4.2.1 without saved SHSH keys. UPDATE: Please think first, before you do something. UPDATE 2: If you have 05.13 baseband or lower - do not update! Use PwnageTool. UPDATE 3: If you have 4.1 and 3gs with new bootrom, do not update to 4.2.1, create custom 4.1 firmware using pwnagetool. These are instructions on how to jailbreak and unlock your iPhone 3GS on iOS 4.1 using PwnageTool 4.1.3 for Mac OS X. This tutorial will explain how to upgrade your baseband if needed for an unlock. For iPhone 3G use this tutorial. There is no unthethered jailbreak for new iPhone 3GS bootroms and iOS 4.2.1 yet, so you should stay at iOS 4.1. Important: iPhone3GS users with old bootroms who want to go to 4.2.1 and unlock should not use this PwnageTool! Update to stock 4.2.1 first, then use new redsn0w to update your baseband. UPDATE: Обязательно (!) думайте перед тем, как что-нибудь сделать. Читайте внимательно и еще раз думайте. Не понятно - читайте снова. Спрашивайте до, а не после. UPDATE 2: Если у вас 05.13 baseband и ниже - она ломается старыми способами, не надо обновляться до 05.14, 05.15 и 06.15. Хочется перейти на 4.1/4.2 - тогда делайте кастом прошивку с помощью pwnagetool. Данное пошаговое руководство позволит вам сделать джейлбрейк и анлок iPhone 3G на iOS 4.2.1 с помощью PwnageTool 4.1.3 под Mac OS X. Здесь также будут даны инструкции по обновлению baseband, если это необходимо для анлока (отвязки от оператора сотовой связи). Для iPhone 3GS используйте руководство для iPhone 3GS. Для пользователей Windows есть соответствующее пошаговое руководство. Just a day after PwnageTool 4.1.1 release, DevTeam created one more update for popular jailbreak utility - PwnageTool 4.1.2 for Mac OS X. This release should solve some problems that users had. However there are still users reporting iTunes errors when restoring custom firmware. Anyway PwnageTool 4.1.2 is worth trying. You can download PwnageTool 4.1.2 here. Here is a step-by-step Tutorial: how to jailbreak and unlock your iPhone using PwnageTool. These are instructions on how to jailbreak your iPhone using PwnageTool 4.1.2 for Mac OS X. If you need unlock and you have not updated to iOS 4 you will be able to preserve baseband and unlock iPhone using ultrasn0w. This guide will work for iPhone 4, iPhone 3GS, iPhone 3G, iPod Touch 3G, iPod Touch 4G, iPad and AppleTV. Just use the right firmware and select the right device (step four). Make a folder called "Pwnage" on the desktop. Now you need to download there PwnageTool 4.1.2 from here and iOS 4.1 firmware from here. When downloading the IPSW file, it is best to download it with Firefox since Safari often auto extracts it! Double click to mount PwnageTool then drag the PwnageTool icon into the Pwnage folder.